After the infamous tumultuous journey, the most eagerly anticipated car of 2009 (as per our polls)- The Tata Nano, may finally roll out on January 26. Tata dealers and Auto experts say that Republic Day would be a preferred day to bring out the 'People's Car'. So, the Tata Nano is now all set to reach the homes of the People, but bookings will not open until March 2009. Very recently, Tata Motors had called a meeting with all its dealers in Mumbai. There, Mr.Debashish Ray, Corporate communication Head at the Tata Motors gave clues about Nano arriving in the market in the shortest possible time. Will the Rs.1 Lakh promise be kept? Tata Motors Ltd., the owner of popular British marques such as, Jaguar and Land Rover sport-utility vehicles, must repay a $3 Billion loan! With an aim to introduce the Nano (world's cheapest car) this month end, one can only imagine Tata motors' struggle! The Indian carmaker needs to raise cash by June to repay a bridge loan taken to fund last year's purchase of Jaguar and Land Rover from Ford Motor Co. The Rs.1 Lakh Nano car, already delayed, is crucial to revive falling demand here in India. The global credit crunch has forced Chairman Ratan Tata to reconsider a plan to raise $600 million from investors abroad. Instead, the company is offering small investors up to 11 percent interest for three-year deposits after raising 41 billion rupees ($840 million) through a rights offer in October. Collapsing sales at Jaguar and Land Rover in the U.S. and Europe are echoed by plummeting demand for cars and trucks in India. Tata Motors' sales,excluding Jaguar and Land Rover, fell 47% in December, the highest in at last four years, after declining 30 percent in November. Earnings last quarter that ended in September dropped 34 %. The company may post its first quarterly loss in seven years in the three months ended December, according to Macquarie Research. Moody's Investors Service and Standard & Poor's cut their debt ratings of the company in the last quarter, citing falling vehicle demand. "In view of the significantly changed business environment, Jaguar Land Rover's requirements have increased beyond the original plan,'' spokesman Debasis Ray wrote in an e-mail. "Urgent action is required to support the U.K. car industry.'' he said. Tata - India's third- biggest carmaker plans to sell the Nano in limited quantities in March by producing it at satellite factories like Pantnagar and Pune while it completes work at the main mother plant in Sanand(Gujarat). "Rather than hurriedly introducing the Nano while demand is falling, Tata Motors should start selling it later in the year", said S. Ramnath, Director-Research at IDFC-SSKI Securities Ltd. "Some 10,000 cars coming out will not change your life, It will be riskier to launch it in smaller quantities before your main factory is ready. Some bad publicity and the product will be gone'' he added. "In the current environment, even the Nano's low price may not help it attract buyers who want to trade up to a car from two-wheelers", said V.G. Ramakrishnan, Senior Director, transport and logistics at Frost & Sullivan. "Tata Motors is creating a new segment altogether with the Nano,'' said Ramakrishnan. "That segment of customers is more sensitive to economic changes than high-income people." Car sales in India have fallen in four of the last five months through November as banks tightened credit and charged higher interest rates on auto loans. This has hindered Honda Motor Co. from opening its second factory in the nation. Growth in India's $1.2 trillion economy may slow to 7 percent in the year ending March 31 from 9 percent or more in the previous three years, according to the government. Exporters in India have cut about 65,500 jobs as recessions in the U.S. and Europe damp demand. Tata Motors' stock fell 78 percent in 2008, and was the second-worst performer in the Bombay Stock Exchange's auto index. The shares fell 4.8 percent to 165.75 rupees in Mumbai on Jan. 9. The difficulty of raising funds may prompt Tata Motors to consider selling Jaguar and Land Rover to another company in the Tata Group, according Mahantesh Sabarad, an analyst at Centrum Broking Pvt. "Ratan Tata underestimated the financial crisis,'' said Juergen Maier, who manages $500 million of assets in China, India and Russia, including shares of Tata companies, at Raiffeisen Capital Management in Vienna. Maier had craftily sold Tata Motor shares after the automaker announced plans to acquire Jaguar and Land Rover. Mr.Vinayak Kulkarni, an avid IAB reader, has sent us a few snaps of two Nano variants. The Nanos were caught while they were being tested on NH-4 (Golder Quadrilateral). According to Mr.Vinayak, "The max speed is limited to may be 90kmph, i had taken snaps when it was traveling at 82kmph, The rear tires seem to be slightly tilted inwards while the front wheels are slightly bigger than that of an auto rickshaw's. The size of front and rear wheels differ by large amount. Its height is equal to that of Maruti Suzuki Wagon-R"
In the picture above, one can clearly compare the Nano's size with the reigning India's cheapest car - Maruti 800. 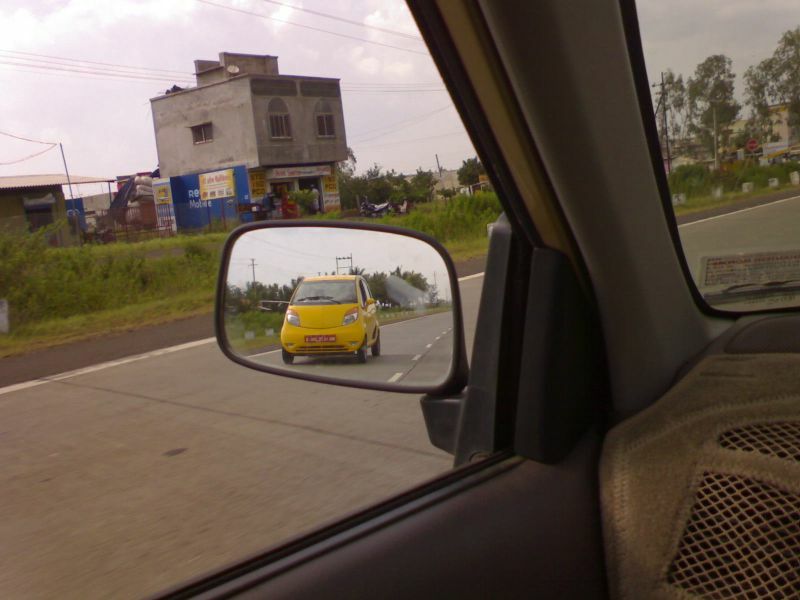 Below, see if you can compare the Nano's size with the blue Maruti Alto (behind the nano). IAB Comment- We were informed that the base variant would have fixed rear windows glass, and the white-colored car photographed, which appears like the base model (going by the black-colored bumpers) has it's windows rolled down. Was the glass broken? Or was a different variant testing with black colored bumpers? Maruti Suzuki to discontinue Maruti 800 from April; All-new 800 coming soon!